Despite vastly different diets, this couple whipped up a recipe for relationship bliss. You can too! When we spew off our must-haves for the perfect mate—sense of humor, steady job, an encyclopedic knowledge of Breaking Bad—rarely do we talk about food. When was the last time one of your friends said she's looking for a guy who's tall, dark, handsome and knows five tasty ways to prepare Swiss chard? But when it comes to eating habits and relationships, what ends up on the dinner table can be just as important as what goes down in the bedroom. In fact, as we pointed out last week in our story 7 Reasons to Date a Vegetarian, a third of omnivorous singles wouldn't even consider dating a non-meat eater. Pssh! So, in a world dominated by carnivores, what's a bacon-free bachelor or bachelorette to do? Well, for the 7.3 million vegetarians in the US (according to the Vegetarian Times) there are a number of veggie-only dating sites. Among them are VeggieDate.org, VeggieFishing.com, VegetarianDating.com and EthicalSingles.com. That said, how boring the dating pool would be if we all stayed in our own grocery aisles? To figure out how two people on opposite sides of the dietary spectrum could ever come together, we chatted with New Yorker Kristin Jackson. While she's vegan, her boyfriend Jake is a full-fledged BBQ-lovin', steak-makin', meat-eating man. Kristin keeps a blog, My Fit Decision, where she chronicles her healthy lifestyle, including the his-and-hers meals she creates. Here's what Kristin told us about how these two lovebirds make it work. To those 30 percent who don't think omni/veggie love is possible, take note! That's 'V' as in vegetarian or vegan. For Kristin, who has been meat-free in some form since she was 13, there was no pre-vegan era in her relationship with Jake, who she started dating two years ago. So how did she first introduce her diet? "I tested the water on the first date," she says. "He asked where I wanted to go for dinner so I picked a vegan place. He was cool with it." Before dating Jake, Kristin had been on a couple dates with guys who weren’t as keen on her restaurant selection, and she knew right away that they weren't matches. "It's a good sign if a guy is open to it right off the bat. If he's not open to trying a meat-free meal on the first date when he's trying hard to impress you, then he's really not going to be up for it on the tenth date." she says. When eating out, Kristin admits that she sometimes annoys Jake with her lengthy requests. "I'll pick something and tell the waiter to hold the chicken and the cheese and the egg, and Jake is like, "I don’t know her!’" she says. But for the most part, any hard feelings come from a place of concern. Kristin remembers one night out when she was stuck eating a plate of pickled cabbage for dinner because there weren't many meatless options. "When that happens, Jake doesn't get angry at me for not eating meat," she says. "Rather, he feels upset that I have to just sit there and watch him eat a plate full of food." Fortunately, though, experiences like that are few and far between because the couple keeps an eye on local menus, and they know the spots that suit them both. They've zeroed in on places like Mable's Smokehouse in Brooklyn, which serves both beef brisket and vegetarian sloppy Joes. While other couples might take a trip down the frozen food aisle for granted, for Kristin and Jake it's a weekly bonding experience. "You can learn a lot about people when you watch what they put in their grocery carts," says Kristin. While she's more comfortable in the produce section than at the deli counter, the two choose to focus on what they have in common when they shop, like an interest in eating healthy. "Even though I don't eat meat, I'll still help Jake pick out chicken and come up with a healthy way to prepare it," she says. Their common interest in eating well is more the focus than the fact that she prefers tempeh to a t-bone. When Kristin and Jake eat together at home, whether at her place or his, they make a point to eat similar dishes, even though hers are meat-free. 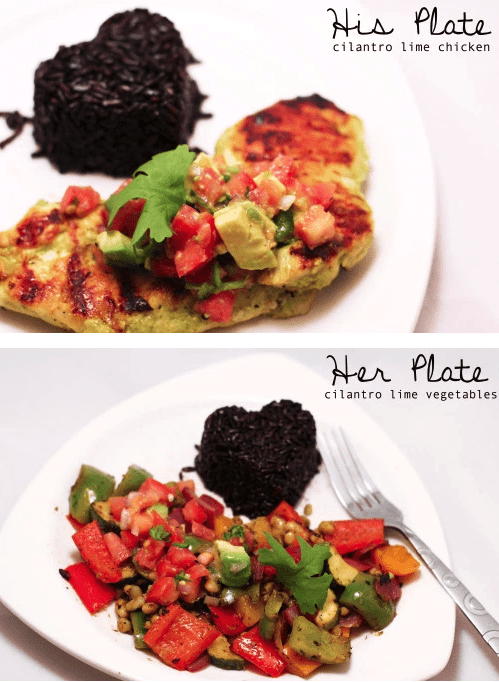 On her blog, Kristin details these dinners with "His Plate/Her Plate" posts. One week it's sweet potatoes for her, and mango jalapeno sausage for him, both served over brown rice and beans. Another week it's a Caribbean theme, and though she's made jerk chicken for him and jerk cauliflower for herself, their meals look surprisingly similar. Making visually cohesive meals is important to the pair.